This is a summary of the voodoo required to get WCF services hosted in IIS to work with a load balancer and kerberos. This took me way longer than I had hoped to figure out so I hope I can save someone else that pain. We have recently been running some load and stress tests against our latest Golden Gate SP1 product which supports the horizontal scale out of workflow services. This scale out capability is one of the core features of Windows Server AppFabric. Our software is designed to run in an ‘on premise’ scenario and leverages Windows integrated security for authorization of users. A major performance improvement we discovered during our original Golden Gate testing was to ensure kerberos was used rather than NTLM when performing Windows Authentication. We wanted to ensure that our new services were using kerberos for Windows authentication since we had moved some of our services from being hosted as a Windows Service to being hosted in IIS, in particular the workflow services. Note: in addition to performance advantages, you need to use Kerberos if you want to achieve multi-hop delegation of credentials, NTLM does not support this. The resources at the end of this post discuss this further. In this post I’m going to walk through a worked example and give a checklist to follow. In a later post I may drill down into a little more of the background, in the meantime I’ll include some additional resources at the end. The virtual host name for the NLB is svnlb301.ap.aderant.com. Alongside the three application servers is a database server that hosts the ADERANT Expert database, the AppFabric monitoring database and the AppFabric workflow persistence database. 1. The servers must be in the local intranet zone of any calling machines. As of Windows Server 2003, by default only the local intranet zone supports the passing of credentials for Windows Integrated authentication between machines. This makes sense as you rarely want to pass your Windows credentials beyond your own domain. 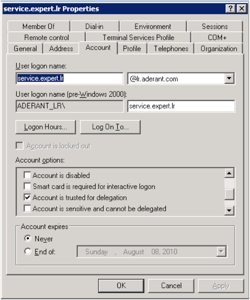 At ADERANT we have a group policy set-up so that all machines have any machine with a name matching *.aderant.com registered in the local intranet zone. You can explicitly name the servers for the zone, also ensure that the servers are not listed in the Trusted Sites zone. 2. Windows Services exposing WCF net.tcp endpoints must have SPNs registered for both the application server and the network load balancer addresses. There is an identity element that specifies the expected identity of the service host. There are two different options supported: and . If your service is published on a domain and you always expect the client calling the service to be online, then the userPrincipalName is easiest to configure. The value attribute contains the identity that the service is running as, e.g. value=“ADERANT_AP\service.expert”. If you are running a development workstation, you will often see HOST/localhost as the SPN generated by the svcutil for locally hosted WCF services. This indicates that the service is expected to be running on the local machine. The account must also be granted ‘Log on as a service’ rights on the application server hosting the service. This can be set-up using the local machine policies admin tool or pushed out via group policy. 3. Load balanced WCF Services hosted in IIS, using HTTP bindings, must have HTTP SPNs added for the account of the application pool. Here we have both the NetBIOS and FQDNs for the servers and the load balancer. 4. Load balanced WCF services hosted in IIS, using HTTP bindings, must use the Application Pool credentials to issue kerberos tickets. In addition to adding the SPNs in 3, now change IIS so that it uses the app pool credentials for the kerberos ticket. This can be done either through the configuration manager in IIS or from the command line. The obscured section path is system.webServer/security/authentication/windowsAuthentication. This has to be set on all of the application servers within the application farm. While in IIS configuration, it is also worth setting authPersistNonNTLM to true, see http://support.microsoft.com/kb/954873 for details. 5. 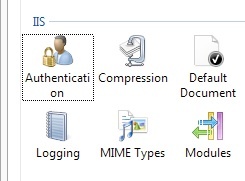 Enabled Windows Authentication on the required web applications in IIS. There are two parts to this, the first of which is to ensure that the Windows Authentication provider for IIS is installed. This can be checked in the Windows features control panel. 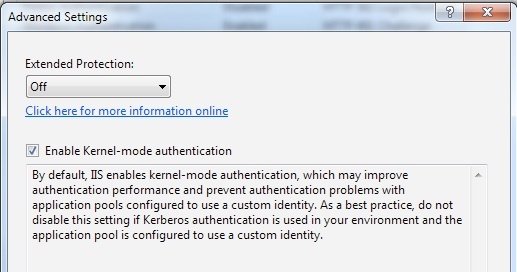 While you are here, it’s worth checking the advanced properties of the Windows Authentication (available from the context menu) to ensure that Kernel-mode authentication is set. 1. ensure the servers are in the local intranet zone. 2. create and register SPNs for net.tcp services for all app servers and the load balancer. 3. create and register HTTP SPNs for all app servers and the load balancer. 4. take care to avoid duplicate SPNs. 5. understand that NetBIOS and FQDNs require separate SPNs. 6. set useAppPoolCredentials to true on all IIS servers in the app farm. 7. run all application pools using a common domain service account, give this account permission to delegate and log on as a service. 8. ensure the web applications for the services have Windows authentication enabled. It’s mostly straight forward once you’ve been through the steps once. The easiest tool to test with is a browser and Fiddler. From within Fiddler you can look at the authorization headers for the HTTP requests which will show you if kerberos or NTLM is used. We expose an OData service which requires Windows authentication, it was very easy to trace the authentication negotiation going on for this site within Fiddler.